Hollywood is currently obsessed with exploring the nature of pop superstardom, and casting big names to headline movies on the subject. Lady Gaga's performance in A Star is Born has her staring at a possible Oscars victory, while Natalie Portman played an unusual pop princess in Vox Lux. Now it's Elle Fanning's turn in Teen Spirit, which finds the young actress performing a number of contemporary hits. 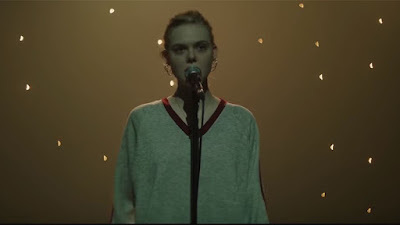 Marking the directorial debut of actor Max Minghella, Teen Spirit, which clearly draws its name from the Nirvana classic, follows a young woman who longs to escape her small town by winning a singing competition that make her a pop superstar. This is the third trailer for the film we've seen and each one is more earnest than the last. That's not a bad thing because Fanning does earnest very well, and she's clearly got the voice for songs by Robyn, Ellie Goulding, and others that she'll be performing. Here's the official synopsis: Violet (Elle Fanning) is a shy teenager who dreams of escaping her small town and pursuing her passion to sing. With the help of an unlikely mentor, she enters a local singing competition that will test her integrity, talent, and ambition. Driven by a pop-fueled soundtrack, Teen Spirit is a visceral and stylish spin on the Cinderella story. Also starring Rebecca Hall, Zlatko Buric, and Agnieszka Grochowska, Teen Spirit opens April 5th.